According to the National Library of Medicine, “Treatment” for opiate withdrawal “involves supportive care and medications.” When a given patient attends inpatient rehab for opioid withdrawal, a number of different pharmacological therapies may be used, especially because certain opiate withdrawal treatment medications are more beneficial to some patients than others. These medications, while providing similar effects, are all very different and may be taken for varying periods of time. Clonidine is the most commonly used pharmacological therapy for individuals who are going through opioid withdrawal, according to the NLM. It is in the category of centrally acting alpha-agonist hypotensive agents, and it is often prescribed to treat high blood pressure. It may also be used in combination with other medications to treat symptoms of attention deficit hyperactivity disorder or ADHD in children. It can be used in smoking cessation programs and as a treatment for alcohol withdrawal as well. Among its most important benefits for those in inpatient opioid withdrawal rehab, clonidine treats cramping and muscle aches. People who suddenly stop taking opioids often experience severe pain in their abdomens, muscles, bones, and joints. This is because opioids cause pain relief when a person is under their influence, and the sudden absence of the medication in a person’s body after the body has become dependent on this effect will cause them to feel any pain they were already feeling more acutely as well as intense aches all over the body. Unfortunately, the drug does not help patients dealing with severe gastrointestinal problems such as nausea, vomiting, and diarrhea. Clonidine itself can cause some of these same side effects, so the healthcare professionals in your inpatient program will likely treat your gastrointestinal problems with another medication. It is common to feel drowsy or dizzy when taking clonidine, but the side effects of the drug are fairly mild. It also treats most of the extremely painful side effects of opioid withdrawal. The medication itself is very beneficial for the treatment of opioid withdrawal, which is why many inpatient facilities use it. However, other medications that are actually opiate-based can be helpful as well, as clonidine only treats the symptoms of opioid withdrawal and not opioid addiction as well. According to Harvard Medical School, “Methadone” as a treatment for opioid addiction “can be continued indefinitely, or the dose can be gradually reduced in preparation for withdrawal.” Either way, the medication may be used in inpatient care as a short-term or long-term treatment for opioid withdrawal. Methadone is a synthetic opioid that causes the same effects that other opioid drugs cause, but when it is taken in low doses, it does not create the intoxication effect other the drugs do. As stated by the NLM, methadone also “works to treat people who were addicted to opiate drugs by… preventing withdrawal symptoms in people who have stopped using these drugs.” Methadone can be extremely beneficial as individuals who take it can slowly withdraw from the drug after becoming stable or stay on it indefinitely as stated above. It can be very helpful for patients who are attending inpatient treatment for their opioid addictions who would otherwise be suffering from the symptoms of withdrawal. Methadone does have drawbacks though. A person can become addicted to methadone the same way they can become addicted to oxycodone, heroin, or other opioid drugs if they begin abusing it. Therefore, it is much safer to be in an inpatient environment during the early part of your treatment, especially if you think you may be likely to abuse methadone. If you suddenly stop taking methadone, you will experience the same withdrawal symptoms that other opioids cause, another reason that inpatient care can help you stay on track and avoid dangerous consequences with your medication. “More than 100,000 American addicts are now using methadone as maintenance treatment,” though, and as a pharmacological method that has been used since the 1960s to treat opioid withdrawal and addiction, methadone can be very beneficial (Harvard). 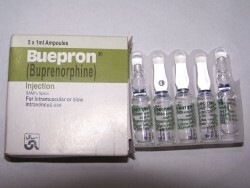 Like methadone, buprenorphine works by blocking the opioid receptors but does not cause intoxication when taken at low doses. But buprenorphine is a partial opioid agonist, which means that its agonist properties are not as intense as methadone’s. “Because buprenorphine is unlikely to be as effective as more optimal-dose methadone, it may not be the treatment of choice for patients with high levels of physical dependency,” according to the Substance Abuse and Mental Health Services Administration. However, in the case of a patient who requires moderate doses of medication for opioid withdrawal treatment, buprenorphine has been found to be just as effective as methadone. Patients usually receive buprenorphine alone at the beginning of their withdrawal treatment in order to help them become stabilized. When a patient has stopped experiencing issues with their medication and does not have severe symptoms related to their opioid withdrawal, they are often switched to a combination of buprenorphine and naloxone. This combination protects the individual from abusing the drug, as the naloxone causes withdrawal to precipitate immediately if the tablet is crushed and snorted. Buprenorphine is more difficult to abuse than methadone, but this problem still does occur. However, it is safer in overdose situations as the partial agonist status makes it less likely to cause severe respiratory depression. Buprenorphine is a newer pharmacological option for opioid-withdrawing patients, and like methadone, it can be taken for a short period of time to facilitate withdrawal or a longer period to reduce the symptoms and allow the person to live their life as they work on their recovery. Do You Need Help for Opiate Withdrawal? If you need opiate withdrawal treatment––or if you would like to learn more about the medications provided at inpatient rehab centers for this particular condition––call 800-429-5210 today and speak with a trained addiction treatment counselor. We can help you learn more about your treatment needs and find a facility where you can receive opiate addiction and dependence help.